Left to their own devices, the police found themselves for the first time in a troublesome quandary. Suddenly stripped of the compass of the law, unable to decide which of the emergent governments should be considered lawful, and realizing the fictitiousness of any government outside the ring of the cordon, the unemployed blue people swiftly came to realize that they were less real creatures with every passing day, becoming metaphysical fiction. 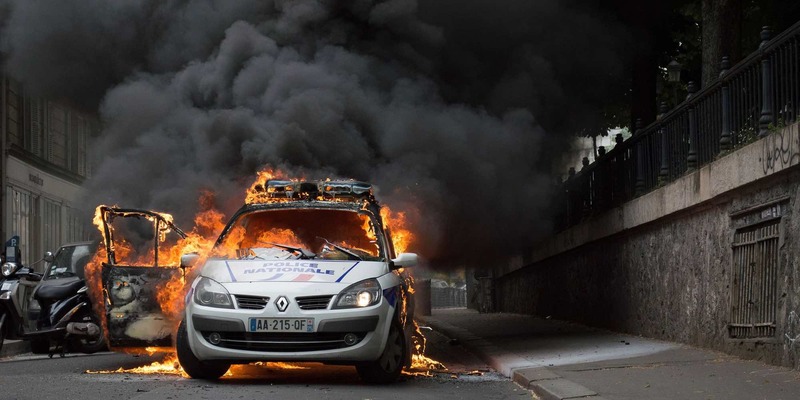 This report details the trials following the arson of a police car set on fire in May 2016 during the upheaval against the Loi Travail in France, and all the expressions of solidarity that accompanied them—including a fresh outbreak of arsons against police infrastructure. Months pass, years pass, yet the situation in France remains unstable as the rhythm of social and political struggles accelerates. The events we will describe here are a consequence of the political situation in France and in Europe as a whole: the repercussions of the 2008 international financial crisis are still noticeable in our daily lives, European governments and their security policies can’t contain or palliate the “refugee crisis,” the ISIS attacks, the State of Emergency, the COP21, increasing disillusionment with traditional political parties, never-ending austerity measures, elections in which the far right is gaining more and more power. As is typical in France, the end of the summer holidays heralded the resumption of struggle. Indeed, the newly elected and self-proclaimed “revolutionary”1 French President Emmanuel Macron and his government are preparing a new liberal version of the labor legislation that was the cause of the struggle against the loi travail. The current version was imposed by the previous Socialist government only a year ago, under Hollande’s presidency, despite a wave of social upheaval that shook France in protest against it. We can appreciate the contempt and cynicism of this quote. But the most significant events of September 2017 took place inside the High Court of Paris. Some 16 months after the events, nine individuals faced trial for participating in a spontaneous action and counter-protest in which a police car was set on fire. The trial was scheduled for September 19-22, 2017. Lundimatin summarized the context surrounding the fire that happened on May 18, 2016 at Quai de Valmy. In, May 2016, while the upheaval against the Loi Travail was still at its height, a police union named Alliance seized the République Square in Paris, the site of the ephemeral French movement Nuit Debout. The union’s main objective was to stage an illusory reconciliation between the French population and their police. To do so, the union invited some major figures from the Front National, the far-right and fascist French political party. As police agents took pictures with fascist stars, other police units that were still on the clock protected their colleagues’ gathering. Tensions increased between counter-protesters and law enforcement units, who were shoving and pepper-spraying activists as usual. A spontaneous march broke out in response. On its way through the streets of Paris, the crowd encountered a police car stuck in traffic. The car was attacked and set on fire. In response, Manuel Valls, then Prime Minister, said that he wanted “relentless sanctions” inflicted on the individuals who took part in the attack. The judicial machinery didn’t take long to designate and arrest its first suspects. When the trials started, two defendants remained incarcerated, six were under judicial control, and another individual couldn’t be found, as he never responded to the summons sent by the court. Threatened by the uncontrollable rage rebels had unleashed in the streets, which sent sparks of insurrection flying throughout Paris and other cities, the French government saw in this event a perfect opportunity to re-establish order and reassert its authority. As the trials approached, we all knew that they would be dramatically publicized and politicized, as they would pit anti-authoritarians against the institutions of the police and the state itself—and also because the authorities could use the verdict to intimidate anyone who might wish to express opposition towards the state, its laws, and its policies. Will they succeed? That has yet to be seen. The following text has been assembled from translations and adaptations of various reports on the trial hearings and articles related to the case. In sharing these narratives, we hope to offer a broader understanding of the case, and to reveal the obvious political repression and spectacle organized by the court, the police, and the state against our companions. This article was originally published on Wednesday, September 20, 2017 by Non Fides. Large numbers of people converged in front of the 14th chamber of the high court, even before the starting hour of the hearing. Journalists were there too. First, they took pictures of those who wanted to be photographed; then they snapped away at the defendants when they were asked to enter the courtroom. Their microphones hovered over the heads of the supporters. Part of the crowd protested and reacted: some umbrellas were opened and brandished so no pictures could be taken, several familiar faces were heckled, and later on, some stickers were stuck on camera lenses. During the defendants’ exit, by a side door, a welcome stampede enabled the crowd to push the journalists away while they were trying to steal some images. Meanwhile, people rushed in front of the closed barriers and slowly started to warm up by asking for a bigger courtroom. Numerous lawyers also entered the room one by one. There were at least 18 people in lawyers’ clothing inside the room. The police let the judiciary press enter the room until the box was full; then they let the defendants’ families enter one by one after checking their IDs. Cops insisted on selecting who was allowed to enter the room and who was not, so only those considered “really close,” “the parents,” “the dad and the mom” were allowed to enter the room. Eventually, however, they ended up letting some of the defendants’ close friends enter without asking for any ID. Finally, they announced that five or six seats were still available for the public. Inside, some seats remained available, as well as some space for those who preferred to remain standing, but a large part of the public stayed outside with the rest of the journalists. Once the judges were seated, a lawyer took the floor to complain about the lack of space and demanded a bigger room “in the name of all the defense lawyers.” Someone in the audience pointed out that the room was also way too small to welcome all the relatives and the public who wanted to show support at the trial. The judge replied curtly that this person was not allowed to speak. But as an answer to the lawyer’s request, the hearing was suspended a first time. It resumed after half an hour. Some additional chairs were brought for the lawyers and in order to enable more journalists to enter the room. When the judge tried to call the roll of the defendants, the lawyers went further by explaining that the conditions of the trial were not “worthy of a normal defense,” as they were prevented from having physical access to their files. A lawyer added that it was important to let the journalists enter the courtroom, as it was a “symbolic case” involving police violence. Another took the prosecutor to task for being personally responsible for scheduling the trial in such a small room. In their turn, journalists put pressure on the court to allow their colleagues outside to report on the hearing. To that end, they even threatened to leave the courtroom all together. The president of the bar, previously called by the defense lawyers, asked for some calm and to take into consideration the observations and requests made by the defense. The judge responded that additional chairs had already been brought to the room. The latter was also talking at some point about letting everyone in the audience sit in on the hearing by establishing some kind of rotation, to take place every two hours. He also insisted on the “serenity” wherein the trial had to take place. Meanwhile, outside, the slogan “a bigger room” was amplified to such an extent that we could actually hear it over the repeated calls for calm made by the Judge. Throughout the entire hearing, we would hear inside the courtroom all the slogans chanted by those who remained outside and continued to demand “a bigger room” and freedom for the prisoners. The defense lawyers stood up to officially protest. One of them explained that it would be impossible to rotate the public: how to choose among them? How to deal with those who would not want to leave? Should we rotate the journalists too? He asked for the hearing to be suspended for the rest of the day and for the trial to resume in a bigger room the next day. Another comment: even with the added chairs, the lawyers didn’t have access to their computers, and couldn’t open their files properly, while the prosecutor was comfortably seated on his chair with a direct access to a computer. There was no “equality of arms.” The Judge told him not to be so excessive, and asserted that this problem is always solved in practice. A lawyer threatened to move the arguments to the juridical field and cited the European Convention on Human Rights, as well as the rights of the defense. He threatened to file requests to nullify the trial if it continued under such circumstances. The judge took him at his word and said that the court was ready to deliberate on referral requests as well as on nullity requests if they were formulated, and this after the prosecutor’s opinion. The lawyers confirmed. The prosecutor didn’t have any opinion of the adjournment’s request, as he didn’t know the availability of the other rooms in the court. He insisted on saying that “since the first minute of the hearing, the defense’s rights were respected” and insisted on the efforts provided by the court, explaining that the day’s circumstances were the fault of lawyers who added their names to the original list of participants, and that the public and the journalists already had enough space. The room growled inside. We could still hear chants and shouts coming from outside. The hearing was suspended once again so the judges could rule on the request for adjournment. In their turn, the judges announced the end of the hearing for the day. The trial would resume the following day (Wednesday September 20) inside the 16th Chamber at 1:30 pm, one floor downstairs. We were expecting a criminal chamber (like that day) with probably more space for the lawyers and at best 20 to 30 more people in the public, but probably no more “serenity” than that day. This article was originally posted on Thursday September 21, 2017 by Non Fides. On Thursday, the hearings began at 10 am in the 16th Chamber. The pressure was set up from the entrance of the Court where gendarmes physically searched bags after checking them through x-ray scanners. They were especially looking for stickers, handouts, and umbrellas as they had received the order to seize such items. These security measures blocked the progress of the waiting line. As a result, numerous supporters found themselves stuck outside, as well as four defendants who hadn’t been summoned. The latter finally gained access to the courtroom at 1:50 pm. The hearing opened with the roll call of the defendants and the civil parties, the reminder of the charges, and the roles attributed to everyone involved in the case. Then, several lawyers argued to nullify the trial. First, the lawyers of two individuals still incarcerated claimed that their detention was irregular, as no written decisions were published after the previous hearing on July 17, 2017. Another lawyer filed a conclusion concerning the inadmissibility of considering the police union Alliance as a civil party in this trial. They based their argumentation on specific case laws that specify the conditions in which a professional union can or cannot form a civil party during a trial. The Alliance lawyer answered this request by contesting the admissibility of the conclusions, arguing that Alliance has been a civil party since the beginning of the trial, and such criticism should have been made earlier. After the lawyers replied to the arguments presented by the prosecutor, the court left the room for a moment, then returned. It was decided that the “incidents would be added to the content,” which means that the decisions regarding the requests to nullify would be pronounced only during the verdict of the trial. Then the judge began summarizing the facts. The testimonies of some storekeepers were read, numerous videos were presented and watched, and the statement of Allison Barthélémy—the passenger officer in the burnt car—was read, even if she wasn’t present inside the courtroom. The first defendant was interrogated. She appeared before the judge in custody and accused of throwing a small metal post into the front windshield of the police car. The judge quoted her previous interrogations and commented on several pictures attached to the file, but the questioning ended soon as the defendant refused to talk. A second defendant was called to the bar. He was accused of hitting the car and one of the police officers with a metallic rod. He recognized the facts and explained them by the increasing anger he felt while taking part of several demonstrations and realizing the disproportionate police violence during them. He ended his explanation by saying that he regretted his actions and apologized to the police officer. For almost two hours, the judge and the prosecutor interrogated him. They confronted him with other videos of the demonstration, in order to try to demonstrate that he was also violent towards police officers on other occasions. After a hearing suspension, the judge reviewed the calendar of the trial. He announced that the discussions would start on Thursday and Friday at 10 am and the verdict would be given on Friday September 29. In turn, the fourth and last defendant of the day was called to the bar. He was accused with the same charges as the previous one, but also for refusing to have his DNA taken during his arrest. In a situation similar to the previous one, an object was extracted from the sealed evidence in order to learn whether it was a truncheon or a broken stick of a shovel. Then a debate began regarding the presence of “tear gas” in his house (we supposed that the judge was referring to pepper spray). The courtroom reacted when the judge presented some pictures that supposedly showed the defendant. It was obvious that it wasn’t him in the pictures, especially because the individual in the so-called evidence was a smoker, while the defendant is not. His lawyer protested that there was no objective element in the accusation. The defendant admitted his presence at the demonstration but insisted that he wasn’t next to the car during the attack and that he wasn’t masked. At 8 pm, the hearing was over. It would resume the next day at 10 am for the interrogations of the other four defendants. The police intercepted two individuals as they exited the court and forced them into an unmarked police car. They were sent to an unknown destination, maybe because they were seen on video cameras putting stickers inside the Court premises. It seems that a small group of people were blocked at the exit of the court with their identity taken. Finally, two individuals were immobilized in one corner of the courtyard (the walls had bars on them) before being taken away for having put some stickers inside the premises. The police may have used video surveillance to bring these charges. Some of the people present during the arrest reacted and tried to block the police car that was taking the two arrestees away. If the crowd had been more numerous and more determined, it would probably have been possible to make this arrest more difficult to manage, or at least not to let the cops do their dirty work so quietly. This article was originally posted on Friday, September 22, 2017 by Non Fides. The hearings took place from 10 am until 7:30 pm, with an hour break at noon. The four defendants who hadn’t been interrogated the previous day were questioned one after another. The first one was accused of hitting the driver and breaking the back windshield of the car with a post. The second one was accused of having been present in the area during the attack. The third was accused of having pointed out the cop car during the movement of the crowd through the street and for having raised his arms to the sky when the police car was set on fire. The fourth and last defendant was accused of having broken the back right side window of the car with a small post. Then the judge presented the evidence against the ninth defendant, accused of throwing the flare inside the car. This defendant wasn’t present in the courtroom and wasn’t represented by a lawyer. The atmosphere inside the courtroom was tense. Two individuals who came to support the defendants were expelled, and one of them was directly thrown off the court premises. Gendarmes were threatening us with expulsion if we looked at our phones, while the Alliance cops (who came to support the civil parties) seemed to play “Candy Crush” in the back of the room. On several occasions, there were loud reactions among us concerning the remarks of the prosecutors or the behavior of the gendarmes and Alliance cops. At one point, the gendarmes in front of the courtroom tried to admit a pro-cop individual dressed in a blue, white, and red shirt (patriotism is fashionable). It was the same individual who had been insulting people the previous day. Some supporters decided to block him, but unfortunately police officers took that opportunity to expel some supporters from the premises of the high court. The pro-cop guy was permitted to stay in the courtroom while most of the evicted persons were not allowed to re-enter the court. The two individuals arrested the previous day were released after 24 hours in jail, with no further action taken against them so far. Inside the corridors of the court, an investigation was taking place. Two police officers with photos of anarchist stickers were wandering around looking at the walls. At some point, the closest restrooms were entirely disinfected and cleaned—but not for long, as soon after, they were covered with graffiti and stickers once again. This article was originally posted on Saturday September 32, 2017 by Non Fides. The verdict, initially scheduled for September 29 at 11 am, was postponed and delivered later. A more precise date was given the following Wednesday, September 27, the day when the lawyers would finish their pleas from 9:30 am until 1 pm, during a final hearing. Moreover, at the end of the day, around 9:30pm, the court had to decide whether to release Kara and Krem, still incarcerated at the time of the trial. The court refused to release them. In solidarity, part of the audience shouted “Freedom” and “Courage” inside the courtroom. Joachim (Swiss): 8 years imprisonment coupled with a detention order (he is currently on the run; an arrest warrant has been issued, as he is accused of throwing the flare that set the cop car on fire). Antonin: 5 years imprisonment with a one-year suspended sentence coupled with an order to be kept in jail and forbidden to take part in any demonstration in Paris for 3 years. He already served 10 months of preventive detention. Nicolas: 5 years imprisonment with a two-year suspended sentence without a detention order (due to his “clear act of contrition during his hearing” and the absence of “recidivism risk” according to the prosecutor), and being prohibited from taking part in any demonstration in Paris for 3 years. He already served 13 months of preventive detention/remand. Krem: 4 years imprisonment, currently kept in detention and facing a ban on taking part in any demonstration in Paris for 3 years. He had been in preventive detention/remand for 7 months. Kara: 3 years imprisonment with a one-year suspended sentence and a 3 years ban of entering the French territory (due to her US nationality). She had been in preventive detention/remand for 16 months already. Thomas: 3 years imprisonment with a two-year suspended sentence coupled with a ban on participating in any demonstration in Paris for 3 years. No detainment order (this means he faces one year of actual imprisonment). Angel: one-year suspended sentence and a ban on taking part in any demonstration in Paris for 3 years. He already spent 42 days in preventive detention/remand. Bryan: one-year suspended sentence and a ban on taking part in any demonstration in Paris for 3 years. A €1000 fine for refusing to give his DNA. He already spent 4 days in preventive detention/remand. Leandro: one-year suspended sentence and a ban on taking part in any demonstration in Paris for 3 years. He also already spent 4 days in preventive detention/remand. The police union Alliance asked for €5000 for “moral prejudice” regarding their professions (with arguments such as “these acts of violence are similar to terrorist acts”). The lawyer of Alliance is Ms. Delphine Des Villettes. Kevin Philippy, the cop who was driving the car, asked for €30,000 of “damages and interests” (his lawyer is Ms. Michèle Launay). Kevin Philippy, security assistant, tried to pass the official exam to become a policeman four times without success. Thanks to the incident of the police car arson, he was exempted from the exam and accepted into the police school of Sens, from which he “graduated” on March 20, 2017. Currently a trainee police officer, he will be given tenure in March 2018. The judicial agent of the State asked for €1500. This article was published on September 28, 2017 by Paris-Luttes.Info. The defendants Kara and Krem attended, but in custody, under arrest. This morning, the atmosphere was really quiet inside the Court. Absolutely no noise from outside disrupted the pleas of the two lawyers besides the anxious sound of the sirens of police cars. The hearing started with the plea of Antoine Vey, the lawyer representing Nicolas. In front of a rigid, even stoical judge, Antoine Vey began by denouncing the political aspect of the trial: the instructions of Manuel Valls, who had been Prime Minister at the time, but also the use of police premises during custody in which flags of the police union Alliance (known for extremely reactionary politics) were displayed on the walls. He explained that the defendants having been described as guilty even before the trial took place, and that this had had serious consequences for them. Antoine Vey defended Nicolas affirming that he “did not handle the events, he did not manage this violence. He did not claim it.” After quoting Foucault about “the facts, the sanction, the torture,” the lawyer asked for the sentences to be personalized. Then, it was the turn of Arié Alimi, Antonin’s lawyer, to plead. He started his speech by showing some compassion towards the civil parties, then reminded the court that his grandfather was a police instructor in Algeria during the state of emergency. He explained that since the events in Sivens (where the young demonstrator Rémy Fraisse was murdered on the night of October 25, 2014 by a police grenade), there has been a clear change of doctrine regarding law enforcement. He said to spare a thought for Rémy Fraisse, the Traoré family, Théo, and the Bergson’s student (all victims of police violence). He expressed himself strongly against the imbalance in the prosecutors’ closing speech. For several years, Antonin was constantly targeted by the DRPP (the Intelligence department of the Parisian police). In the 11 cases the DRPP presented against him, Antonin was discharged, or the cases were dropped. Arié Alimi analyzed the anonymous testimony (“T142”). The police officer indicated at numerous occasions that he didn’t want to answer the lawyers’ questions. According to Arié Alimi, the testimony is no longer credible. The police officer’s refusal to explain his statements could allow the defense to initiate legal proceedings against him. Antonin had an injured wrist in May 18, 2016, an injury that he received a month and a half before the day of the demonstration, “therefore, he couldn’t lift the post during the events” explained his lawyer. The lawyer brandished several pictures taken from videos and printed on cardboard paper to support his arguments concerning the common clothing features of demonstrators. According to Arié Alimi, the prosecutor didn’t use all the pictures available in the file. The prosecutor “lied intentionally.” The testimony of the police officer was that Antonin was wearing a neck warmer and not a hood; moreover, during house search, they didn’t find the incriminating vest. “He is not the aggressor!” said his lawyer. The “kung-fu” police officer (a nickname given to Kevin Philippy, the police officer assaulted during the events) didn’t even recognize Antonin behind the one-way glass. Arié Alimi asked for discharge for Antonin. The verdict of the trial was to be delivered on Wednesday, October 11 at 10 am. The court cleared out while Krem and Kara were handcuffed before being sent back to prison. Shouts of “Freedom!” echoed in the hallway of the high court of Paris. Solidarity has always been a core principle of anarchist values. Without a doubt, it is an extremely important weapon, especially during moments of hardship or isolation. As in every upheaval that ends with massive waves of repression, the demonstrations against the Loi Travail in 2016 sadly resulted in numerous people being injured, arrested, and prosecuted. Nevertheless, acts of solidarity broke out immediately. Activists snatched arrestees back from the police during demonstrations, preserving their freedom. People gathered in front of police stations where friends were arrested and organized benefit shows to cover arrestees’ legal expenses. Regarding the arson trials, you can find a detailed list of solidarity actions here. A version of this list is available here in English. This Thursday (Sept. 21), at 3 am, second day of the trial of the burnt cop car. We have entered the gendarmerie barracks of Vigny-Musset. We set on fire 6 intervention vans and 2 logistics trucks. The garage and the warehouse were devastated for more than 1500 square meters. This action is part of the wave of solidarity attacks with the individuals on trial during these days. A thought for Damien, who was beaten up by cops recently. Whatever the outcome of the trial will be, we will continue attacking the police and their justice. Our hostility is a spreading fire. Another mainstream article, this time from Libération, explains that the entire offices of the gendarmerie were reduced to ashes, including the criminal investigation department. Moreover, the “wave of attacks” mentioned in the arson communiqué echoes the arson of five police vehicles in Limoges on Tuesday, September 19, 2017, a few hours before the opening of the trial. In the same article, we learn that local authorities noticed that, lately, numerous anonymous arsonist actions and communiqués were posted on independent medias platforms such as Indymedia. According to the journalist, this reveals a special use of arson among some radicals, especially against “necro-technologies”: arson against a mobile phone antenna in Ardèche last July; arson of Enedis’ vehicles and offices in Grenoble last May and in the department of Drome last June (Enedis, or ERDF, is the company that controls and manages the electrical network in France); or against “social control,” like the arson of CCAS vehicles in Grenoble last March. Immediately following the appearance of this arson communiqué, the French authorities once again undertook to employ the chief tools at their disposal, fear and intimidation. Even if we all know that the state will always defend its legitimacy and power by all means necessary, we can perceive an obvious escalation of state repression against anarchists and radicals. One of the best examples is the aftermath of G20 in Hamburg. After the rebellion against the G20 summit that lit up this past summer, in addition to several trials and sentences requested against people arrested during the G20, the German government struck back against “left-wing extremism” by shutting down Linksunten Indymedia and raiding several houses. In France, several hours after publishing the communiqué on their website, Indymedia Grenoble received an email from the Office Central de Lutte contre la Criminalité liée aux Technologies de l’Information et de la Communication (a police organization dedicated in fighting cyber-criminality), asking them to remove the arson communiqué within 24 hours and threatening to shut down the media platform. The communiqué is considered to be “advocating terrorist acts.” You can read a copy of the email sent to Indymedia Grenoble here. Indymedia Nantes also received this official request. Surprisingly, and without giving a clear explanation of their decisions, both websites decided to give way to the authorities’ request. You can read their communiqués (still in French) here and here. Meanwhile, mainstream media outlets published the same communiqué without receiving any threats from authorities. These events raise several questions: How independent can alternative media be? Why obey the threats of the police and the state? How “safe” are we when we use such platforms? How far are authorities willing to go to track down anarchists and other radical activists? But also—how can we effectively resist this escalating repression? It is more important than ever to discuss these issues as the witch hunt continues in the streets, the courtrooms, and online. The following is an adaptation and translation of an article posted on October 11, 2017 by lundimatin. The nine defendants were condemned to a total of 30 years of prison and more than 40,000 euros in damages. The police presence was particularly visible this morning in front of the high court and inside the halls of the palace. Numerous gendarmes were also supporting the walls of the courtroom. Once the defendants sat down, the hearing started with the conclusions raised in limine litis. The court stated that having the police union Alliance as a civil party in this trial was admissible, and that the detention orders against Kara and Ari (aka Krem) were legitimate. Then the court examined the content of the case file and the main charges selected. The president invoked a restrictive use of the concept of participating in a gathering with the purpose of committing violence, and concluded that the simple fact of hiding one’s face wasn’t enough to confirm this charge. Regarding the intentional element mentioned in the charges, he reckoned that the individual had to show a will to participate, or for others to participate, in these acts of violence. Concerning the anonymous testimony, without discussing the quality or legitimacy of the witness, the court insisted on its convincing force, but pointed out that this testimony itself wasn’t enough to establish guilt. Therefore, other elements and evidence should support it. Regarding the acts of severe violence, he highlighted that, apart from the use of the metal bar, posts, and flares or smoke bombs, the fact of hitting an immobilized vehicle with bare hands, while two persons where still inside the vehicle, was sufficient to be characterized. Concerning the destruction of the vehicle by arson, the Court concluded that the collective action contributed to the realization of the damage. Then, the court discussed the facts. Regarding Angel and Bryan, the court concluded that the charge of participation in a violent gathering couldn’t be used against them from the moment that the investigation failed to establish where the two defendants were during the assault on the car, so the court discharged them. However, Bryan was sentenced for refusing to give his DNA. Concerning Kara, the court reminded the audience that she recognized her culpability. Then, via the voice of its president M. Alçufrom, the court talked at length about the hypothetical consequences of her action… “And what if the windshield had shattered? The two police officers would probably be dead…” The president even discussed Kara’s journey: she came from the US, then stayed in Germany and Kurdistan, adding that “she held back from assaulting police officers in other countries,” and affirmed that somewhere else, for such actions, “she could have vanished into thin air in the proper sense, as well as in the figurative sense.” According to the president, she “took the liberty of acting that way” because she knew the behavior of the French police. The court retained as incriminating evidence the contradictory declarations of Antonin during the investigation, declarations that all turned out to be false. The court even asserted that the tracking and triangulation of his cellphone enabled them to locate him near the store he said he had spent the afternoon in, but unfortunately, there was nothing to prove that he was actually inside of it. The court imputed the blows against the driver to him, as well as the insertion of the post in the back windshield of the car, due to “the perfect correlation between the attacker and Antonin.” In the meantime, the court invoked “the absence of any reasonable doubt” regarding his identification. The president qualified these as acts “of extreme gravity” which embodied an “urban guerilla scene,” and asserted that Antonin attacked the police officers as some others would “attack black people because they are black.” Finally, the court also condemned the absence of regrets expressed from the defendant, the refusal to discuss the violence endured by the two police officers, and multiple internet researches on the effects of different acids. The president concluded by asserting the existence of a risk of recidivism. Concerning Léandro, prosecuted for participating in a violent gathering, the court concluded that his behavior wasn’t passive, that he encouraged the authors of the violence by his presence. The president reminded him that when the court asked him why he didn’t step back when the attack started, he answered during the hearing that “he didn’t have to step back.” The court concluded with a “characterized” participation to the violent gathering. Regarding Thomas, the president recalled in detail his behavior during the demonstration, mentioning the blows and punches he administered to the car, though this aspect hadn’t even been mentioned in the file previously. He was convicted for acts of violence and degradation. Bryan: Discharged for taking part to the gathering, but sentenced to a €1000 fine, with a reprieve of €500, for refusing to give his DNA. Léandro: Guilty for taking part in the gathering, 1 year suspended prison sentence (and no ban on participating in demonstrations). Thomas: Guilty, sentenced to 2 years imprisonment with a 1 year suspended sentence. Kara: Guilty, sentenced to 4 years imprisonment with a 2 year suspended sentence, held in detention. Ari: Guilty, 5 years imprisonment with a suspended sentence of 2 years and 5 months, held in detention. Nicolas: Guilty, 5 years imprisonment with a suspended sentence of 2 years and 6 months, without a detention order. Antonin: Guilty, legal recidivism, 5 years imprisonment with a 2 year suspended sentence without an order for detention. Joachim: 7 years imprisonment with an arrest warrant. Yesterday, Today, or Tomorrow: The Fire Will Never Go Out! Several gatherings were organized to greet the verdict of the trial on October 11, 2017. Many people gathered outside the court around 10 am to support the defendants. As mentioned in the article by lundimatin, numerous law enforcement units were protecting the surrounding area and entrances to the high court, which is located on Ile de la Cité in the center of Paris. According to one article, when the verdict was pronounced, people outside the courtroom shouted “Tout le monde déteste la police/la Justice,” “Ni oubli, ni pardon,” “Liberté!” (respectively, “Everyone hates the police/Justice,” “No forgetfulness, no forgiveness, “ “Freedom!”) before being pushed out of the building by police forces. Later that night, several hundred people gathered in Ménilmontant despite the deployment of police forces in all the neighboring districts (between République and Bastille). According to an article published by Paris Luttes Info, there was a similar police presence on the night of the last presidential election. The action started, but rapidly police forces intervened and managed to block part of the crowd. However, the police didn’t succeed in containing the collective rage and euphoria of the night. The greater part of the procession avoided the police lines and rushed through the narrow streets of Paris, determined to express their love and solidarity with the defendants and to show their hate for the state and its justice. Walls were repainted with messages, the storefronts of banks, a clothing company, a business school, and jewelry stores were smashed, and several trash containers were set on fire. Then the storm dispersed and vanished into the darkness of the night. We, occupiers of the Institute of Geography, occupy this site for several reasons. First, we refuse all neoliberal and security policies, whether from Macron or not. We occupy in the same state of mind as the ones who filled the movement of spring 2016 with life. We also occupy in solidarity with the defendants of the Quai Valmy case. We ask for the release of all the defendants, knowing that this is the trial against the Loi Travail. Finally, we occupy to protest against the filthy feast of the managers of the biggest companies in France, who are coming to celebrate the victory of “France as a Business” on October 12 at the “pré Catelan” in the Bois de Boulogne. To their wealthy banquet, we oppose our feast and invite anyone who relates to this occupation to come and support it. Particularly, we are calling academics and intellectuals to take position in favor of the occupation, so the threat of eviction that it faces will be harder to carry out. Against the capitalist occupation of the world, let’s occupy universities! You can read the communiqué in its original version here. The heavy verdicts in the arson trials remind us once more that police and the justice system are simply two arms with which the state dominates the population. Whatever type of political system you live under, from dictatorship to social democracy, police and the justice system will always fulfill the same purpose: enforcing the power and authority of the state while imposing a supposedly “natural” social order on society via intimidation, harassment, and violence. In these strange times, when blatant new waves of nationalist and fascist ideology are spreading alongside virulent economic and neo-liberal reforms, when a permanent state of emergency supports a steady stream of new authoritarian policies, it seems undeniable that more obstacles, hardships, political repression, and uncertainties are to come. However, let’s not surrender, never! There’s too much at stake. This is why our love, solidarity, and thoughts are with those behind bars or in courtrooms facing charges, as well as with everyone still out there in the streets, on the run, or hiding somewhere in the shadows, who continue fighting with all their hearts against authority, capitalism, and the state without any rest or truce. Our insatiable thirst for freedom will always be stronger than any of their laws, bars, or walls, stronger than the concrete and steel they continuously surround us with. Let our love and rage speak through an unstoppable and uncontrollable incendiary storm! Fire to the prisons! Fire to their justice! Fire to the state! Fire to their world! In November 2016, while running for president, Macron published a book entitled Révolution, in which he tried to embody a new political posture, supposedly more pragmatic, and claimed to supersede the traditional opposition between Left and Right. This entry was posted in Commentary, News blog and tagged anarchism, france, insurrection, Security State. Bookmark the permalink.